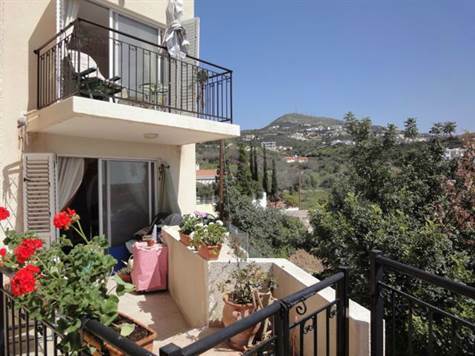 Tala, Paphos - This 2 bedroom end townhouse is situated within easy walking distance to the popular village of Tala which has many local amenities including a lively village square with a good variety of restaurants and tavernas. Paphos is a 10 minute drive away. At the entrance to the property is an attractive landscaped garden with colourful flowers and shrubs and space for barbecuing. The accommodation is designed on 3 levels. At ground level is a cloakroom, comfortable lounge, spacious dining room, and well equipped kitchen. Patio windows in the lounge open onto a balcony with gorgeous views, and from the dining room there is easy access to a private veranda again with fantastic views. Upstairs are two good size double bedrooms both with fitted wardrobes and private balconies. The mountain and sea views are stunning. A family size bathroom is accessed directly from the landing which has fitted cupboards and space currently used as a small study area. An internal staircase accessed from the dining room leads down to the basement which includes a small storage/utility room, and a huge store room which can easily be converted into a third bedroom. In addition there is a garage for parking with additional space for storage or conversion. This property has so much to offer and due to all it’s extras and conversion potential is suitable both as a permanent residence or as a holiday home.